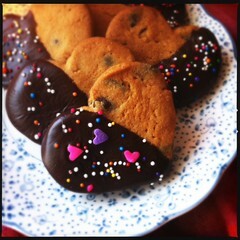 Valentine Heart Chocolate Chip Cookies – Fun, Easy, Quick! Most importantly though, I did manage to get these cookies made in time for Georgia’s valentines day party at school. That’s what counts right? They were quick easy and fun (what kid doesn’t like breaking out the sprinkles?). I used a heart-shaped cookie cutter and made these a valentines cookie, but you could use pretty much any shape and decorate these for any occasion. Egg for EASTER? Hmmm … or you could use a Christmas tree shape like I did for my post at LifeMadeDelicious! I cheated and used the pre-made chocolate chip cookie dough from Pilsbury. Now this dough does not roll out nicely straight out of the package, so … put it in a bowl add 1/4 to 1/3 cup of flour and mix. Sprinkle a clean surface with flour and roll out dough. Cut into desired shape, but on a parchment lined cookie sheet and bake as per package instructions. Remove the cookies from the oven. Allow to cool completely. I put mine outside for 5 minutes (it’s Canada folks!). Now melt some chocolate melts in the microwave. I use the Wilton brand from Michaels. Dip the cookies in the chocolate (partially), add sprinkles, place on a sheet of parchment to harden. Love them! Sooooo cute!! I might just steal the idea next year for James’ fundraising for World Youth Day 2013!! Wow, that are so cute. Helping you select the best value 12v coolers available n the market. It is really easy to make and it have great taste to have from home easily. It is so yammy and healthy. wow soo sweet look delicious!. i try to make it similar. but im fail! Wow, those look great! I was looking to fill out a holiday recipe book for myself and I think I am going to add these under Valentine’s. Thanks! These look so cute. Going to try and make them with the kids this weekend. Thanks for sharing. They are so full of colors. Gonna tell my wife to prepare them right away. Oh, I love these cookies! They are so cute!! Can’t wait to make them!